Facial feminization surgery (FFS) has recently developed within the field of facial plastic surgery and is defined as “a combination of surgical and non-surgical procedures which aim at increasing the femininity and the attractiveness of the face”. The principles of FFS are the result of most recent studies focused on the perception of human beauty and gender. These studies, in large part authored by the World renowned Facial plastic surgeon, Dr Jeffrey Spiegel, show that feminine features increase the attractiveness of the face regardless of the gender of the person. In other words, feminine and and attractive are synonyms. Dr Vartan Mardirossian spent extensive years of his training with Dr Spiegel, who is also one of the fathers of modern FFS. 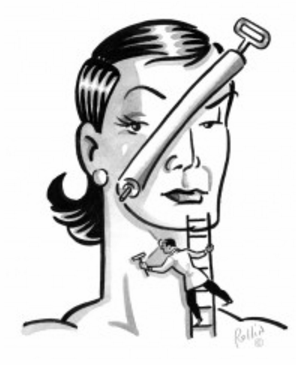 Under his mentor-ship Dr Mardirossian developed not only his surgical skills but also the aesthetic judgement of what interventions to perform in order to make a face more feminine and therefore more attractive. FFS is not only a group of procedures aiming at the feminization of the face, most of all, it is a new philosophy of how to perceive the face in its harmony and balance between light and shadow, feminine and masculine, youthfulness and natural aging. That is exactly why, more than facial feminization surgery, this has been progressively more often referred to as “gender reaffirmation surgery”. The recent years have seen not only a significant number of patients who seek to feminize their masculine facial features, also women who want to look more feminine and therefore more attractive. The surgeries that Dr Mardirossian is extensively trained to perform include forehead reconstruction, scalp advancement, tracheal shave, rhinoplasty and mandible contouring and chin modelling, as well as soft tissue work like dermal fat augmentation, lip lift or facelift. Non-surgical adjustments to feminize the face include botox to the forehead and around the eyes, chin and mandible and restoring volume to the face with injectable fillers. During your visit Dr Mardirossian will evaluate your face and neck and will recommend, in the order of their importance, the procedures that will make you look more feminine and therefore more beautiful. We are excited about the opportunity to work with you and looking forward to meeting you in our Office! My Note: Doctor Mardirossian will be conducting a seminar on Facial Feminization surgery (FFS), Thursday afternoon in Ft. Lauderdale at the Southern Comfort Convention. Please attend and/or come by our booth if you are in the area. Also Doctor Mardirossian will be conduction free private one-on-one consultations, Saturday at the convention. Vartan is my doctor, business associate, and friend.